Am I Ready for College? 4 Tough Questions Answered. It’s Aunt Margie’s 45th birthday party, and you’re celebrating with your family. As you’re waiting in a buffet-style line for pizza with a styrofoam plate in hand, you have a conversation with your Uncle. Simple question, right?? You know exactly where you WANT to go… and what you want to major in… but the thing is, you haven’t been accepted yet. So I’m here to answer some of those tough questions for ya! 1. Are my GPA/Test Scores High Enough? Off the bat, the number one factor in your college readiness is: The school you’re applying to. It’s the same as applying to a job. You wouldn’t submit the same resume to a cupcake shop as you would a law firm, right? Lawyers aren’t going to care about your advanced icing skills, and the cupcake shop will probably be confused as to why you’re highlighting your weekly viewings of Law and Order in your cover letter! So it follows that the number one way to determine if your scores are high enough is to research the schools you’re applying to. Good news is we can make this a little easier on you! If you haven’t, take a quick 30 seconds to create an account on cappex.com, then use their college chance calculator to see what’s called a “scattergram”. This will show you where students fall in terms of acceptance at an individual school based on their GPA and test scores. 2. Is there time to bounce back after a bad semester? Let’s say you did have a really bad semester. Let’s say you dropped a whole grade point average, like down from a 4.0 to a 3.0. Or maybe you were at a 3.5, and now you’re down to a 2.0. Your grade level is your biggest time gauge (for obvious reasons). The closer you are to graduating, the closer you need to be to your goal GPA. This is the ideal scenario. If your GPA dropped your first or second semester of Freshman year in High School, there is definitely time to raise it. You have time to raise your GPA. But it’s going to more difficult at this point because you are also going to need to start focusing on your standardized exams. This is crunch-time! You’re going to have to really kick it in gear, because the Summer before Senior year is ideally when you should start applying to colleges. It’s going to be very difficult to raise your GPA in time, and keep in mind that every school has it’s own application deadlines. How your grade dropped is also important. 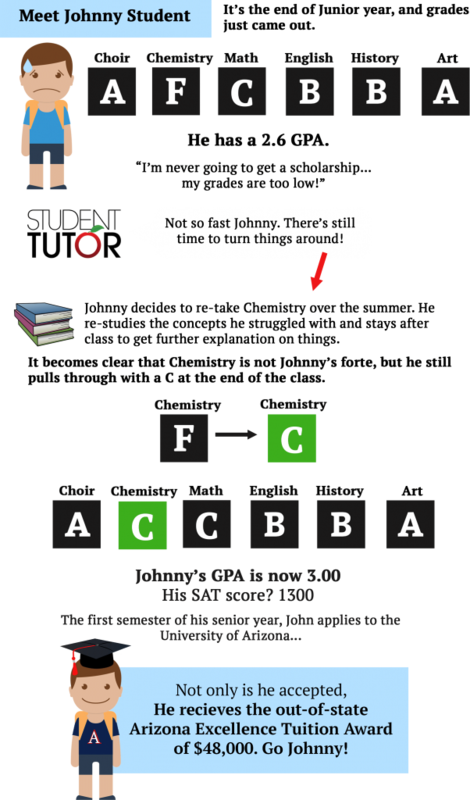 In our article on How to Calculate and Improve High School GPA, we show a mini case study in which Johnny Student is able to raise his GPA from a 2.6 to a 3.00 in the first semester of his Senior year — talking about scholarships here, but focus on the GPA portion! A 3.00 GPA most likely is not going to get you into an elite university, but there ARE universities out there that might accept you. 3. How will my Honors/AP classes affect my college admissions? Our article on AP vs Honors classes does a pretty good job of explaining the differences between the two… but how do they factor into your college readiness?? Again, it’s going to depend on the school you’re looking to attend. If you’re not sure what school you want to attend, then it’s best to error on the side of whether or not you will receive good grades in your AP/Honors courses. If there’s a higher potential that you will do poorly in these more rigorous courses, then it’s probably not worth the risk of lowering your GPA! You can also use the diagram below as a general rule of thumb. Realistically, AP courses are more widely recognized as rigorous across state borders, and Honors courses are most likely to be impressive when the school you took them at is recognizable to the college in question. 4. If I’m a senior with low GPA/Test Scores, do I still have a chance? This is probably the most difficult question we get asked. The reason is because even though we’d LIKE to always find a way for you to meet your goals by graduation, the window of time for when you can be accepted to certain colleges is a very real thing. If you are a first semester senior, there IS a possibility that you can turn things around. It depends entirely on YOUR situation and what actions need to be taken in the time that you have. More likely, though, is that you will need to take the community college route. I think it’s important to stress here that the community college route DOES NOT mean you will NEVER attend your dream college! What it means is that you’re going to have to spend some time making up for the work you didn’t do in High School so that you can be accepted as a transfer student to the college you most want to attend. I hope this article helped to answer at least one of your questions about college readiness. It can be stressful trying to check off all the boxes you need in High School. College admissions are and have always been competitive, and it takes a little elbow grease to make your application shine. And, don’t be afraid to ask for help. This is the reason tutors exist: To help you check everything off your list! Find out more about Student-Tutor’s options for tutoring. College students are always tensed for their lower grades and that stress can harm their assignment work as well. I guess taking any assignment help for a good grade may be the option. What do you say? Sorry not 100% sure I understand the question! These tips will be easier to remember.Thanks for sharing such a nice blog. You’re welcome James, thanks for reading! I really like your blog write-up which is obviously informative & fantastic. Keep sharing more… Thanks a lot!! !